Do I like reading about other people's favourite gardens? Sometimes, sometimes not - it depends on how strong the Moosey ego is at the time. But Alan Titchmarsh's book of his English (and Scottish) favourites has turned into a winner. I'm always nostalgic about great English gardens, though the realities of visiting mid-season can be overshadowed by the human busloads - and the thousands of dollars needed, by me at least, to get there. Aargh! 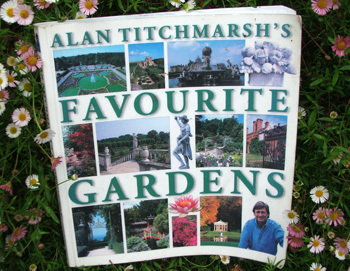 Alan Titchmarsh's book of favourite gardens was much more inspiring that I thought it would be. I felt that I was being given a personal, private tour - a quiet peep, with descriptions of ticket-boxes as well as borders, nursery-cafes as well as rose gardens. And it's nice to read a gardener who isn't afraid to be personal! The list of gardens was, I suppose, quite predictable. But the author did include, modestly, his own garden - nice! And his insights into the famous few - Great Dixter, Hidcote, and so on - were fresh, interesting, and remarkably honest. There were no publicity sentences to spoil each garden visit. Maybe the grandest gardens in England and Scotland don't necessarily go with the grandest houses (and castles), but places like Hodnet Hall, Blenheim Palace, and Powis Castle obviously make brilliant garden settings. Maybe I could get some giant yew topiary, shaped like eggs in egg cups? Hmm... Then again, maybe my garden's more on a par with Sticky Wicket in Dorset, which I really liked the look (and sound) of. Alan Titchmarsh's friendly writing style brought each garden completely to life, and made me want to go and see them for myself. It's a grand read! At the time of writing I've returned this book to the local library, so I can't give the publisher credit. Oops. Here's a link to what I think is Alan Titchmarsh's website shop, where you'll see his books for sale.